Niclas Frisk's work outside of Atomic Swing. 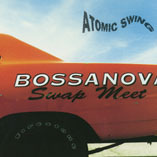 They released some singles and an album in spring 2000! You can buy it at here. They also work together as a producer and songwriter, check below too. Nina(from The Cardigans)'s solo project. Niclas made songs together with them and playing guitar. 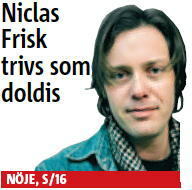 Niclas and Nina won "Swedish Grammis 2002" - Songwriter of the year, for his work for A Camp. It's also got "Best Album", "Best Female Artist" and "Best Lyrics". Niclas Frisk, Andreas Mattsson, James Iha, Vanessa Quinones. 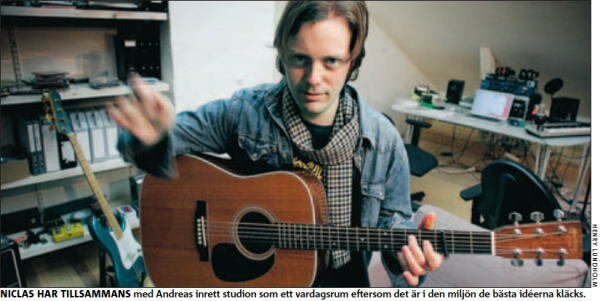 I was writing at this page that Niclas wrote music for a movie called 'Swedish Heroes'(directed by Daniel Bergman). I really wanted to listen the music, and I found by search the VHS at last!! The movie has another title, it's 'Expectations'. Maybe this is a title for overseas. You also can get the NTSC format video at here. I like the thema so much! And from "fluff". 'Waiting On A Friend'and 'Bought And Sold'is played in the movie! I recommend it. I reminds JEFF BECK'Diamond Dust' at the endroll. In fall 2002, Niclas and Andreas wrote music for the germany movie, 'Big Girls Don't Cry（Grosse Maedchen weinen nicht）'!!! The director is Swedish. Here is the official site. 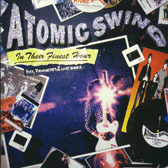 You can check the sound track list, and find "Stone Me Into The Groove" by Atomic Swing!!! And you can see the movie's clip at 'Trailer'. Enjoy it! You can buy the CD and DVD at Amazon.de but it's in Germany.. This movie was shown in Japan as well. The title was "Bittersweet", the official site is here. 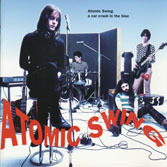 After that, Atomic Swing played a song from this movie, in the comeback album "The Broken Habanas" 2006. 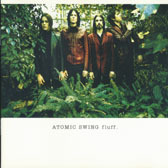 It's "Dreamer's Battlefiled", the cover of "Bombs Bombs away (Teenage Battlefield)" by The Sounds. 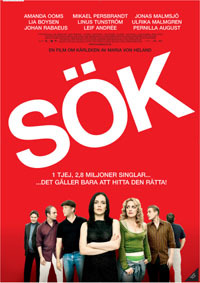 Summer 2006, Niclas Frisk and Andreas Mattsson worked for a Swedish film called <SÖK>. The directer is Maria von Helands, who is the same as 'Big Girls Don't Cry'. You can watch Trailer at the official site, you can listen to the song Niclas singin'! You can buy the dvd at Megastore.se! I bought this DVD at Megastore.se, I watched it. "Pilgrim" is played in the film! And the theme "Swan Song" is such a wonderful tune, I feel so regret that the soudtrack hasn't released.. The film's site has gone, you can't listen to the song on the net now. There is a song Andreas sings as well, and it's quite nice "Release Me" sing by ANNA-MARIA ESPINOZA. (Music by Niclas and Andreas) These are produced by Pelle gunnerfeldt as The Broken Habanas. The movie is in Swedish but you can watch with English subtitles too. 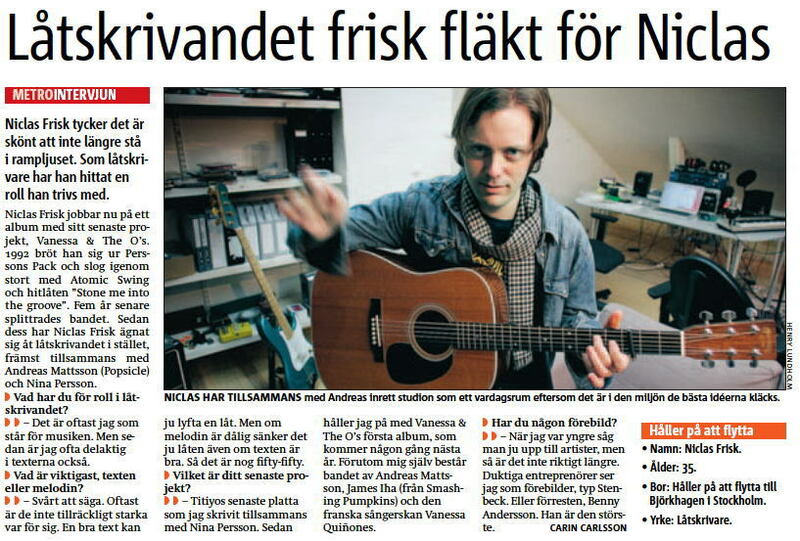 This was Niclas' interview article after the silence of long years! It's only Swedish but Miss.sukenobu has translated to Japanese. You can see it at GO-ON ROCK STATION if you like. The contents are about Vanessa & The O's, Titiyo,..etc. It's written like this; he is comfortable as a songwriter, he think that suitable to himself.. I think I want him to play and sing like before. But anyway I want him to keep making great music as any style. He is the No.1 musician for me, it's never change. Vanessa & The O's is making their first album, it will be released Next Year!! This PDF file was too big to open, so I separated and up here. Here is the interview page. And this is JPEG file of the article. And there is another photo on the top page. Here is the JPEG. And the interview photo is this. Also you can see Niclas' old interviews at Mathias' fan site. Click here. Popsicle / Space Age Baby Jane / Peter Jöback / Brolle Jr / Carola / Ainbusk / Sofia Talvik / Marc sway / Geir Rönning / Vilda baciller(kids TV program) / Rocky Jeans（H&M）commercial / Telia's jingle / Wasabröd commercial / Littlemarbles ... more and more!! Recently he's been touring with Peter Jöback. Also playing with Perssons Pack, the band he was together before Atomic Swing. Niclas' new work, for Swedish cute young girls:Littlemarbles! Niclas played with Jöback on Finnish TV "Bettina S". Peter Jöback's autumn tour is extended until the end of January 2008. Niclas is playing with them. See the tourdate at tour page. Today, 1st Oct, Niclas will appear Studio Virtanen(22.00-) with Peter Jöback and Andreas Mattsson. They will play "Stockholm i natt" acoustic, and talk. TV with Peter Jöback. Niclas is going on his tour from 26th Sep. The file is quite heavy, but singing nice side vocal! 4 days ago, I wrote here about Geir Rönning "Ready for the ride". Then I found that this song was also singing by Marc sway , 2003 in Swiss. You can listen the tune and watch the video at his official site - "MUSIK & VID". Geir Rönning's version seemed to be released in 2005. It's little bit old topics but I found the works by search. 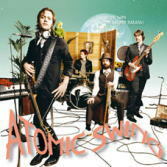 Niclas & Andreas written and produced a song called "The Wholegrain Gospel" for a commercial for crispbread(Wasabröd)! The news source is here, and you can watch the film at Wasa's website. One more, Niclas & Andreas has written a song for a Norwegian singer, Geir Rönning. The title is "Ready for the ride", sounds gospel as well. This source is here, you can listen to the song at his official site. I like these tunes so much!!! Live on TV in his old band, Perssons Pack. Peter Jöback's new song made by Niclas, Andreas and Peter Jöback. This is the video clip, Niclas and Andreas appear! Peter Jöback's new song, live on TV at Skansen, Stockholm. You can see Niclas' play and beautiful Stockholm view, but this file is very heavy!! There is another file which was not on TV, half time, but also this file is very big..
One more song from Sommarkrysset. Niclas is going to play as a guitarist of Peter Jöback autumn tour. See the tourdate at tour page. They wrote for Flera Sidor Av Samma Man too. This album has been such a long hit since 2006. I found an article with Niclas' movie file! The contents is not recent, the stage and interview at Hultsfredsfestival in1998. You need RealPlayer to watch it. I put other articles together here from Aftonbladet.